Venezuelan President Hugo Chavez will be in Russia on Thursday and Friday as part of his 11-day world tour, the Kremlin said. Chavez will meet with President Dmitry Medvedev and Prime Minister Vladimir Putin on Friday, the Kremlin and the government said. Speaking ahead of the tour, Chavez said he would discuss energy and military cooperation in Moscow, including major projects to produce, refine and export oil. The head of Russia’s largest independent oil producer LUKoil, Vagit Alekperov, said earlier a document to establish an oil consortium to develop the Latin American state’s Junin-6 field in the Orinoco oil belt could be signed during the visit. The consortium of Russian producers to work with Venezuela’s PDVSA state oil firm includes TNK-BP, Rosneft, LUKoil, Gazpromneft and Surgutneftegaz. Chavez has recently announced plans to buy dozens of Russian tanks in response to the U.S. deployment of military bases in neighboring Colombia, aimed at curbing the country’s flourishing drugs trade and the activity of FARC guerillas. 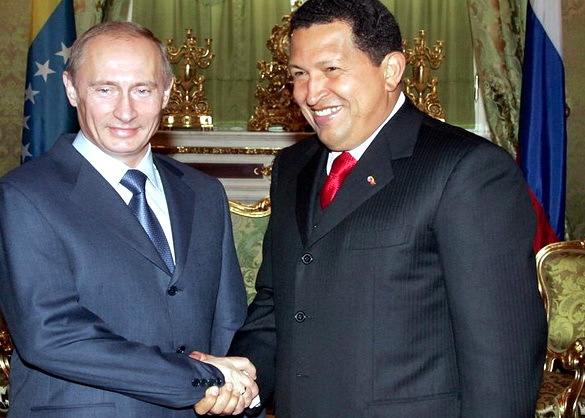 This will be Chavez’s seventh visit to Russia as president. He came to the country twice last year alone. Medvedev visited Venezuela last November, the first visit to the Latin American country by a Russian leader in the more than 150 years they have had diplomatic relations. As part of the tour Chavez has already visited Libya, Algeria, Syria, Iran and Turkmenistan. Russia and Venezuela cancelled entry visas for each other’s nationals in March. Later on Tuesday, Chavez arrived on a visit to Minsk, where he is expected to hold one-on-one talks with his Belarusian counterpart, Alexander Lukashenko, followed by extended talks, according to the BELTA news agency. Belarus and Venezuela have a joint oil venture, and cooperate in construction, mechanical engineering and other spheres. Next Next post: U.S. businessman – $100 million for charity !